My favorite party idea this summer is a pie social. It’s the perfect theme for a backyard get together and such a sweet way to gather friends, play yard games and eat some tasty pie. It’s also a fantastic theme to celebrate a birthday or any other special occasion. It gives you the opportunity to try out some of those favorite pie recipes you’ve been admiring. See below on how to throw the perfect pie social. Recipes: There are some really great recipes in this book! Bake it: A favorite pie dish. I kind of have an infatuation with pie dishes. Serve it: How fun is this pie server? Give it: Easy as Pie tea towel and a carved wooden server. Take it: Boxes to send your friends home with an extra piece of pie. i could definitely get on board with a pie social. i love love love pie! a friend of mine had pies at her wedding rather than cake, needless to say, it was fabulous. those little pie boxes are killing me! and that pie plate is gorgeous! Love the idea of pies at a wedding instead of cake! That’s so charming 🙂 Aren’t those pie boxes perfect?! I love them!!! Hi! I just found your blog via Pinterest and so glad I did. I love the idea of a summer pie social and think fall might be a great time to try this theme too. Adding you to my reader now and looking forward to lots of inspiring ideas from yo in the future. I LOVE LOVE LOVE pie! This would be the perfect party for me! From sweet to savory the possibilities are endless! What a fun idea! A friend of mine does a grilling-fest. I think a pie social would be the perfect compliment to that. Ok I am in LOVE with your blog. Talk about a beautiful layout. 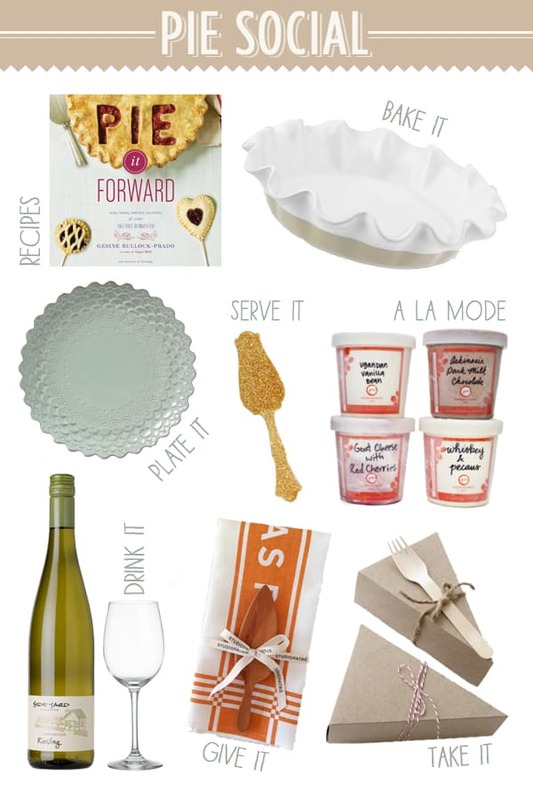 And k this pie social inspiration must be for me because I already own that lovely plate! Got to love Anthropologie. They make all my meals look beautiful. 🙂 I definitely feel like I’m missing out by not owning that pie server though. Seriously, golden and glittery? Can you get any better than that?